4G LTE is gradually sending 3G mobile broadband packing. In Nigeria, we’ve seen MTN, Glo, Etisalat and NTel join the beginning of a 4G LTE era. 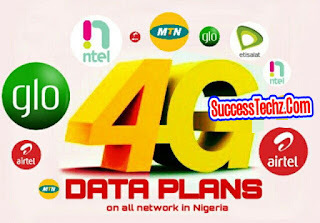 Okay Let’s have a look On how to activate and subscribe to all 4G LTE data plans Network in Nigeria. Airtel Nigeria Is Working Very Hard For a New 4GLTE Service. Airtel Nigeria Has Promised That The 4GLTE Service Will Be Available Soon As Possible. However There's Still Some Affordable 3g Data Plan On Airtel Just N1,500 For 3Gb Valid For 30days, It Works On All Android device And Pc. Dail *440*16# To Get 3gb @ it Now. .. For More Data Plan On Airtel Dail *141# To Purchase Any Data Plan From Airtel Now..
Etisalat Network is The Fatest Network, Especially While Downloading And Streaming Heavy Videos Online With 3g Or 4g Network. .although Etisalat Data Subscription Is Very Cost. All you require to enjoy Etisalat 4G LTE service is only a 4G enabled device. It doesn’t require a Sim change/swap like MTN and Glo. Perhaps, you will have to verify the band your phone is to ensure it complies with their 4G LTE 1800 band. If you’ve met these requirements, you can subscribe to the best plan (see code below), then connect and enjoy fast internet with the 4G regions. Dial *200# and press 3 to get all data tariffs plans for Etisalat 4G LTE service. Glo was the latest to join the trend, they currently have the best and cheapest data plans in Nigeria, with the new 4G services introduced, it’s no different, they maintained the same data plans they had on the 3G broadband leaving them as the cheapest 4G LTE data plans in Nigeria. Send 4G to 400 to check if your device is 4G enabled and to get your sim 4G ready, you have to visit any Glo service center, and exchange your old 3G sum for the new 4G LTE Sim cards. MTN is the leading mobile telecommunication in Nigeria, and was second to kickoff the 4G LTE service after NTel. Fully activate last month, now, let’s have a look at how to activate and subscribe for MTN 4G data plans. …Visit the nearest MTN store or partner retailer to upgrade your old 3G sim card to a 4G LTE Sim.